Everyone's looking for a better night's shut-eye. Each morning, many of us wake up groggy-eyed, promising ourselves, "Tonight, I'm actually going to get an early night." And sometimes we do, and sometimes we don't. Sometimes we sleep terribly; sometimes we think we've slept well but still feel iffy the next day. And when it comes to actually tracking our sleep, it's not always easy to interpret the data, let alone know how to improve. What do all the graphs mean? How much deep sleep do you need? And should your chart really look like that? Well, we've spoken to sleep experts and tried a range of trackers, from the Withings Aura to the Misfit Shine 2 to the Fitbit Alta HR, to try and find the answers you're looking for. Virtually every fitness tracker has the ability to map your shut-eye, but they don't all work the same. They all continuously monitor your movements during sleep – known in professional sleep circles as actigraphy – and assess sleep-wake cycles to see whether you're in deep or light sleep. However, some use accelerometers alone to do this, while some trackers have started incorporating heart rate data to get a better sense of just how deep into your sleep you are. This information is then presented to you the next morning, usually as a graph on your smartphone app. Most monitors will give you a calculation estimating how many hours of each type of sleep you've enjoyed and also how often you woke up. If you have a tracker that also measures heart rate, like the Fitbit Alta HR, you'll also be able to see how much time was spent in REM sleep, as this is something that can be calculated when your heart rate is brought into the equation. Some of the dedicated bedside devices also track sound to record any loud noises during the night to help explain why you woke up, while the Beddit 3 uses a ballistocardiography (BCG) sensor tucked under the sheets to track sleep quality and duration, heart rate and respiration rate. Like some others, it also has a mic to detect snoring, which can be a good indicator of sleep quality. Meanwhile the ResMed S+ detects your breathing patterns from afar to try and work out what stage of sleep you're in. While not as accurate as professional sleep monitoring equipment, or lab tests, fitness bands can help paint a clearer picture of your own sleep cycles. Dedicated bed devices can go deeper, but again, outside of lab conditions it can be tough to get an accurate reading every single night. But what is good sleep? While most of us still think of a solid eight hours as being enough sleep, this doesn't take into account the number of times you wake up, or how much time is spent in each sleep cycle. We also vary, person to person, in how much sleep we need to feel recovered the next day. Stage 1 – The drowsy, relaxed state between being awake and nodding off. Stage 2 – A deeper sleep where your body temperature cools a little and you become disengaged from your surroundings. Stages 3 and 4 – 'Deep sleep'. It's harder to wake up from deep sleep because this is when there is the lowest amount of activity in your body. It's also the part of sleep where your body rebuilds itself and restores energy, and hormones are released. This is the good stuff! After deep sleep, we slip back into Stage 2 for a few minutes before entering 'dream sleep' – known as REM (rapid eye movement) sleep. Each cycle lasts around 1.5 hours and we need to experience all four stages in order to wake up rested. What does a good night's sleep look like? Sadly there's no such thing as a perfect sleep chart, but if you sleep like a baby and wake up refreshed your chart will almost certainly show a steady wave of peaks and troughs. Generally speaking, a good night's sleep consists of cycles lasting for around 90 minutes. Notice that for every cycle the person goes into less deep sleep; this is typical for a normal sleep graph. And while a few drinks can help you fall asleep faster, you can see from this graph that they also mean you'll probably have a lot less deep sleep, be more restless and wake up earlier than usual. Alcohol also tends to keep your heart rate higher. "Each fitness monitor varies in the activities it monitors, the methods used to record them and the feedback given on the data collected. You may have to become your own detective to discover how the tracked data correlates with how you feel during the day and any factors that affect your sleep." Espie continued: "The number of hours' sleep you need is as individual as your shoe size. Don't assume you need the often-quoted seven-to-eight hours – in fact a shorter sleep may mean a better quality sleep." The secret, according to the professor, is "discovering the sleep that you personally need, and then making that your sleep pattern." To gauge just how much shut-eye you need, it is worth analysing how you feel on different amounts of sleep. Do you wake up drowsy after nine hours and struggle to drag yourself out of bed, or are you more productive with an earlier start to the day? As a general rule however, newborn babies need roughly 12–18 hours, kids could do with 10–11 hours, teenagers (contrary to popular myth) only need around 8.5 hours while adults manage on 7–9 hours a day. So while there's some variation between individuals, nobody can function on four hours sleep a night and expect to remain fit and healthy forever. How can we get more deep sleep? According to Professor Espie, "there are many small, practical steps you can take to make your day more sleep-friendly, from getting some exercise to cutting down on caffeine after lunch." But he recommends developing your own "personal wind-down routine". Ideally this would consist of "an hour to an hour and a half before you go to bed when you don't do any work, avoid any 'stimulating' activity such as strenuous exercise, turn off any electronic devices and give yourself time to relax." Easier said than done, especially if you like a night out and/or box set binges, but enjoying better sleep takes practice. As unrealistic as it sounds, try and get to bed by 9:30pm at least twice a week. It will help pay off your sleep debt and make work more productive. Avoid the lie-in at weekends as your internal body clock (circadian rhythm) doesn't stop for Saturdays. Force yourself out of bed and you'll sleep better during the week. Stanford sleep science expert Dr Zeitzer told us: "Changing your sleep patterns will indirectly, through differences in light exposure, change your circadian clock, which helps your brain to anticipate 'normal' or expected sleep timing. So, this would make falling asleep the next night difficult." Call last orders at the bar at least three hours before bed time to give your body time to process the alcohol. If your blood is clear of alcohol, you'll sleep better. How can you sleep more soundly? "A reliable schedule is a critical part of being a healthy sleeper," suggests Professor Espie. "You should make the time to have a wind-down routine to help you relax before bed, and put your day to rest. Aim to stop your work/activity at least 60-90 minutes before bed, and keep your bedroom dark to help signal the body that it's time for bed." "Give your mind something to focus on; one technique that's proven to work is using imagery. Imagine a scene that is calming and relaxing like walking through a favourite park or sailing in a gentle breeze – something that is engaging rather than exciting to the brain." If you're unsure what to do with your sleep data, apps such as Sleepio sync with data from devices from trackers to help build a weekly plan, using CBT (Cognitive Behavioral Therapy) techniques, to help train your mind and body into sleeping better. 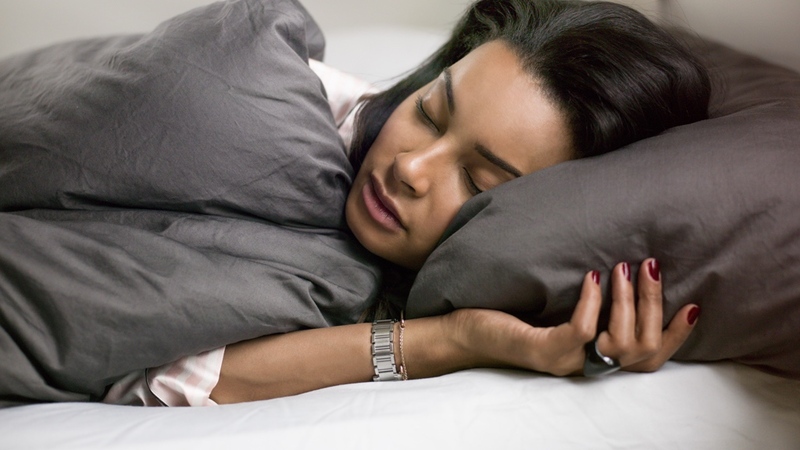 You should also be wary of external factors that can impact your sleep. During our sleep diary, we discovered this was a key issue. Light, sound, and even dust are all things that can interfere with rest. If you think your sleep is suffering, you can try to ascertain any external factors that may be causing it. Devices like the Withings Aura keep a lookout for these things. However, as we found in our sleep diary, overanalysing sleep can end up having the reverse affect. Getting good quality sleep is important, but over-obsessing leads to stress that might only stop you sleeping well. For that reason, it might be worth finding a device that can track your sleep with as little required input each night from you. No one tracker out there is perfect, so you have to weigh up what's most useful to you. Bedtime routines aren't just for toddlers: a relaxing bath or listening to soft music can help you prepare for sleep. Turn down the thermostat as it is easier to sleep soundly in a cooler room. The more you exercise, the more likely you are to improve your sleeping patterns. Eat pumpkin seeds – they contain high amounts of zinc, which can help the brain convert tryptophan into serotonin which helps you sleep easier. Don't drink caffeine after lunch and go easy on the alcohol. Turn off your tablets, as light from gadgets can inhibit and delay the production of melatonin, making it more difficult to get to sleep. Some of the bedside devices use a mix of light and sound to help soothe you into sleep. If you struggle drifting off, it might be worth giving them a try. Avoid spending time in bed when you're not sleeping, as you need to create a positive association with being in bed and being asleep. Learn to listen to your body – if you're feeling tired in the evening, it's probably time for bed. As Dr Zeitzer told us, "When your brain gets tired but you 'fight' the tiredness (ie, try to stay awake), it compensates, we think, by overdriving wake-promoting systems. As the effect of overdriving these wake-promoting systems wane, the tiredness comes back and you either go to sleep or get another jolt of wakefulness. This is most obviously seen in younger children, though it still happens in adults, it's just less obvious."